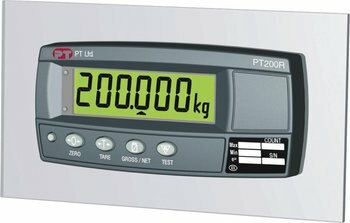 The PT200M Multi-Function is the very latest design indicator, it has many built-in functions allowing it to be used for almost any weighing application, including, Counting, Hold&Peak Hold, Totalizing, Live Weighing and High/Low Level Control. The PT200M utilizes the powerful Sigma~Delta A/D Converter and 4 layer surface mount technology and has a RS-232 serial output for printing, continuous output or basic network polling. There are two transistor drive outputs available for setpoints or High/Low Level Control uses. There is an OPTO-LINK infra-red port designed into the display for PC access to all setup and calibration functions. New Zealand Approval for PT200 series indicators.